Will the current generation Prius get a stay of execution? Toyota Motor reportedly plans to keep selling the current version of its popular Prius hybrid in Japan, even after the third generation is launched later this year. The strategy: Slash the sticker price on the old Prius so that it can go head-to-head with Hondas cheaper Insight hybrid. It is the best evidence yet that Toyota is worried about its first serious hybrid rival. But if true, Toyota would also be taking a big risk by putting a 5-year old model up against a brand-new contender. Toyota declined to comment on the report but Japans Nikkei business newspaper said the old Prius will stay in showrooms and be priced to compete with the Insight, which in Europe is expected to sell for less than 20,000. The current Prius, by contrast, is priced at about 25,000. Sources say the new generation will start at about the same price. Both the old and new Prius will be sold next to each other after the new version is released in May, the Nikkei said. The report didnt specify whether this was a Japan-only policy. A Toyota Motor Europe source told Automotive News Europe that in Europe the third-generation Prius will fully replace the current Prius. Honda had hoped the Insight would scoop an as-yet-untapped low-end market for hybrids. But Toyota apparently doesnt want to surrender this ground without a fight. 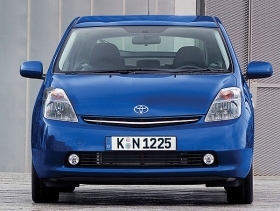 Its belated answer is to make the current Prius cheaper by simplifying the interior, the Nikkei says. The fresh Insight will undoubtedly have more cachet among image conscious green drivers. Why be seen driving a car that has already been on the road for half a decade? And another problem facing Toyota is cannibalization. Potential customers for the redesigned Prius may just opt for the lower-end older generation. After all, it still gets great fuel economy. With gasoline prices far below the highs of last year, customers will see less reason to spend big on hybrids. That goes for the new Prius, even if it does squeak out 50 mpg, as opposed to 46. More importantly, it shows that Honda may be on to something in taking cheaper hybrids to the masses. While Toyota and Nissan roll out ever bigger and more expensive hybrids, Honda is making them tinier and more affordable. A giant like Toyota may have its fingers in everything from full-sized pickups to luxury sedans. But if confirmed, a decision to keep the old Prius in action could be construed as a tacit admission that at least one segment was overlooked.